The new Solax Power Triple Power Battery is available in 4.5kWh (Triple Power T45 4.5kWh) and 6.3kWh (Triple Power T636.3kWh). With 6000 cycles 90% DOD and capacity up to 4 units in series (25.2KhW). Triple Power batteries allow up to 4 batteries to be used in series. In this way, with the 4.5kWh model we can reach 18kWh. And with the 6.3kWh model, up to 25.2kWh. A high li-ion storage capacity suitable for both self-consumption installations and offgrid stand-alone installations. To use the Triple Power it is necessary to have a BMS T-BAT MC0500 unit, with which we can manage up to 4 batteries in series. This unit is necessary even if we are only going to install one battery, as it is the managing brain of the Triple Power. The inverters currently compatible with Triple Power lithium batteries are the Solax Power X1-Hybrid single-phase and Solax Power X3-hybrid three-phase SolaX Power high-voltage inverters. The X1 models can operate from one battery, while in the case of the X3 inverters we will need at least two batteries to operate. 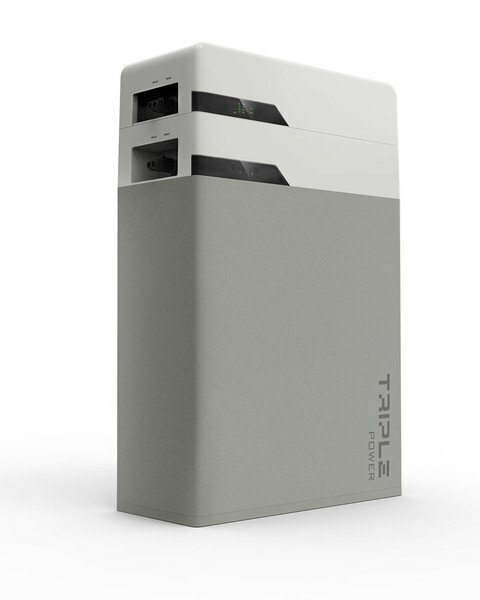 Both the X1-Hybrid and X3-Hybrid inverter models have the ability to work in EPS mode, which makes them extremely versatile, and have accessories for zero injection and wifi adapter.